Consider this a mild frustration-venting get-it-off-my-chest pseudo-rant, but I’m almost starting to regret becoming a fan of Halo. It’s probably not what you think, though. Or maybe it’s exactly what you’re thinking, if you’re familiar with the franchise. I don’t know, I just sort of got here. Emphasis on “sort of.” I’ve long had a soft spot for the series, in a way, except for one key part: the games. They looked great, and I really love the theme song, and the story is kinda cool, but… heaven help me, I’m just not a fan of First Person Shooters. As such, I’ve sort of kept my distance from the series, though I’ve not avoided it, either. I have some of the novels and I’ve seen the Halo Legends anime. 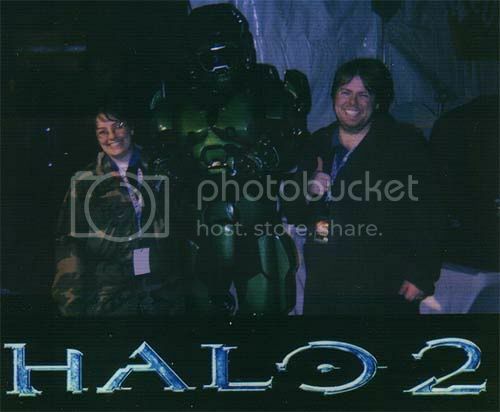 I still have this massive standee in my in-laws’ basement (it deserves a better place) from the launch of Halo 2 when I worked at Blockbuster, and I fondly remember when Nadia and I went to a launch event for the game at Future Shop after she got off work next door, which is when we got our picture taken with Master Chief. So maybe I didn’t quite qualify as a fan. An admirer, maybe? Either way, the genre of choice kept me at bay for the most part — and before anyone brings it up, I’m quite aware of Halo Wars, but I’ve not really done much in the way of real-time strategy, and even at $19.99, that one seems like a bit of an expensive test (though I now see that there’s a free demo… maybe I should give that a shot). I’ve never been able to help but think that if it had been introduced back in the day as a part of a different genre, like a run ‘n gun or a platformer of some kind, I’d have been all over it. As it was, I felt like I was on the outside looking in. But hey, I never had a lot of interest in several popular games; it happens, but this one just felt so close. A few weeks ago, I was at a press event called the Xbox One Loft to learn about the “New Xbox One Experience.” In addition to an interview about the whole thing (which you can read by clicking right here), there were various games from the Xbox 360 library running on Xbox Ones for everyone to check out. Most of it was Rare fare, like Banjo Kazooie and Perfect Dark, as well as some Mass Effect. The folks running this also mentioned a game called Halo: Spartan Assault that I just sort of waved off. I went about my business, but towards the end of the night, myself and another fellow attending were walking around a bit and I saw some people playing this game that had been there the whole time, but I hadn’t noticed. “What is that?” I asked, interest piqued. “That is Halo: Spartan Assault? !” I responded upon hearing the answer. I don’t know what I thought it was before; I have a rough familiarity with most of the Halo games out there and knew there were no FPS games with that name, but here was what was basically an arcade twin-stick shooter in the vein of Smash TV and Total Carnage (from one of my developer soft spots, Midway), but with the Halo brand. So we waited out turn, which ultimately became largely my turn — while the game has multiplayer, it’s not local. I took up the controller and once I got a quick feel for it, I was instantly in love. It is very much like the aforementioned Midway classics, but with its own unique aspects as well that only served to captivate me further. I played and just wanted to finish one more mission, leaving me as one of the last to leave the event — after gushing about what I’d just played to the people running it, of course. I did some research upon arriving back home, learning that it was first released back in 2013 for the Windows Phone — probably why it flew under my radar. An Xbox One release followed later that same year, and without an Xbox One, I’m guessing it again flew under my radar. Xbox 360 and Steam releases came the following year, and iOS this year, but since I’m quite interested in an Xbox One, I’m thinking I may wait until I have that before I buy it and cut loose. Not only that, but apparently a sequel called Halo: Spartan Strike was released earlier this year for iOS, Windows, and Windows Phone. There’s no mention of a console release yet, but my fingers are crossed — I’m rather into the look of that orange/white Spartan adorning the cover art. That all sounds pretty good, right? So what’s the hard part, then? Well, as I tend to do when I get into something, I like to see what kind of merchandise is available — specifically, I was hoping there would be a cool t-shirt I could get my hands on. But not just any Halo shirt will do; I want one sporting the object of my affections, Halo: Spartan Assault… and I’m down with its sequel as well, if only because I like the looks of that creamsicle-colored Spartan as much as the white armored one. Unfortunately, while such merch exists, getting it isn’t quite so easy. These two shirts are pretty cool looking, but hard to track down. I think the one on the right is from the Electronic Entertainment Expo, while the one on the left was part of an eBay auction that frequently carries the same stipulation: no shipping to Canada. And the Canadian side of eBay is pretty sparse in that regard. Found on Amazon.com, easily enough… but the retailers I’ve looked at don’t ship to Canada. Meanwhile, Amazon.ca only has the right design in long sleeves (not very good for me), and the left was in short sleeves… but only in Small and double XL, rather than the single XL I wear. According to the Amazon.ca listing, these came out a bit over a year ago. The out-of-stock Mega Bloks website says they were just $12.99 Canadian — a great deal! But on Amazon.ca, you’re paying at least $56.70 (plus $35.19 shipping) and possibly as much as $308.84 (but at least the shipping then is free). Amazon.com’s listing is a bit better, but still kind of inflated for my liking. I guess my little corner of the Halo universe is just a tad too niche for anything more than just the games I want to play right now. But beyond that? I finally feel at least somewhat properly “in” to Halo, and I can’t wait until the time I can hopefully sit back on my sofa and play both of those games together. So yeah, I guess that’s been the hardest part. But not the worst situation to be in by far, really. Follow-up: Found the demos for Halo Wars and Halo: Spartan Assault earlier and downloaded them, but after playing the latter, the system crashed with two red lights on the left side of the power button. So I don’t think I’ll be trying that Halo Wars demo or playing the other — or anything else on my Xbox 360 — any time soon.